I had pretty much given up on wearing jeans/khakis due to large glute, quads from baseball causing them to not fitproperly in any one pair, relative to my height and waist size . I saw Barbell Apparel on shark tank awhile back and then again at the Arnold Sports festival and finally getting a chance to try them out. I have been wearing my barbell apparel khaki pants for an extended period of time to test its fit and durability from what is promised during my physical therapy internship as an assistant. I won't be lifting/working out in them by any means but in any case, so far the fit is much better than any other pairs of pants I've ever owned. Mobility increase is huge as well. While I may not workout in them, the flexibility of material allows me to better demonstrate exercises and technique to clients and patients in the clinic with no restrictions. I can run, jump, kick, etc with no restriction of movement. It feels like I'm wearing sweatpants at work. 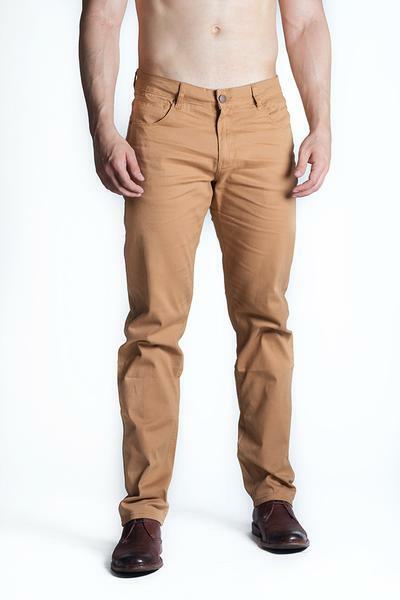 The pants itself are pretty standard as far as design go. They look like regular jeans or khakis, which is exactly the point. The real star of the show is the fabric. A combination of 95% Cotton, 4% polyester and 1% spandex makes the fabric very soft, but more crucially; VERY flexible. Normal jeans/pants have no give what so ever, resulting in the above mentioned constricted legs. But the Barbell Apparel products stretch in all the right places while staying in check in places where no stretching is required like calves or ankles for example. This means complete freedom of movement, which is almost a liberation for someone like me who always had to watch out with movements. No more worries though, these khakis allow you to squat, bend, lunge, twist and swing any way you want to, without ripping open. Demonstrating how to pick something up from the floor is no longer an issue as the pants move with you and allow full ROM. They will set you back $135 (after using my promo code "jones19" for 10% OFF!) plus shipping, which is certainly not cheap. But if you look at jeans from other established brands that are not fitness friendly you could easily be spending that kinda money, so while not cheap the value is certainly there. Since I will be wearing the same khaki pants every day during my next 8 week clinical rotation, I will have to wait to comment on durability, which is the biggest question mark, but I see no reasons, after wearing them several times the past month, to be alarmed. The jeans from Barbell Apparel are exactly as advertised and provide all the benefits of wearing jeans without any of the drawbacks in a, in my opinion, stylish package. These pants fit perfect, look great and also feel so comfortable. The second you try them on you will never want to wear any other pants. My rating is based on the wait to gauge durability and the slight price barrier that may prevent some consumers to be able to afford such awesome pants!